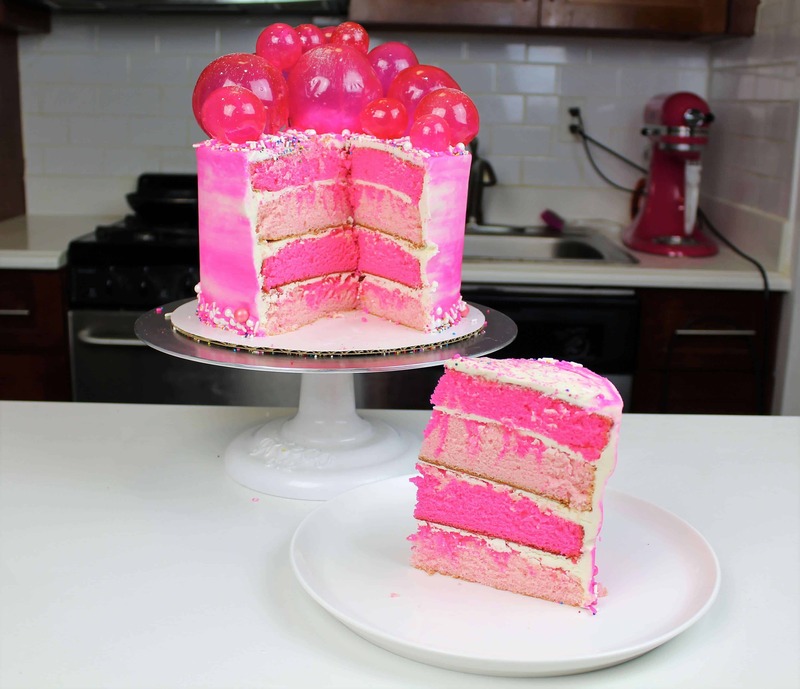 This week I made a pink, bubble gum inspired cake!! Don’t worry, it isn’t bubble gum flavored, just decorated in a bubble gum-inspired fashion. This cake was for Cosmopolitan, and the full video of it can be seen here. It was inspired by the amazing bubble gum cupcakes made by The Scran Line. 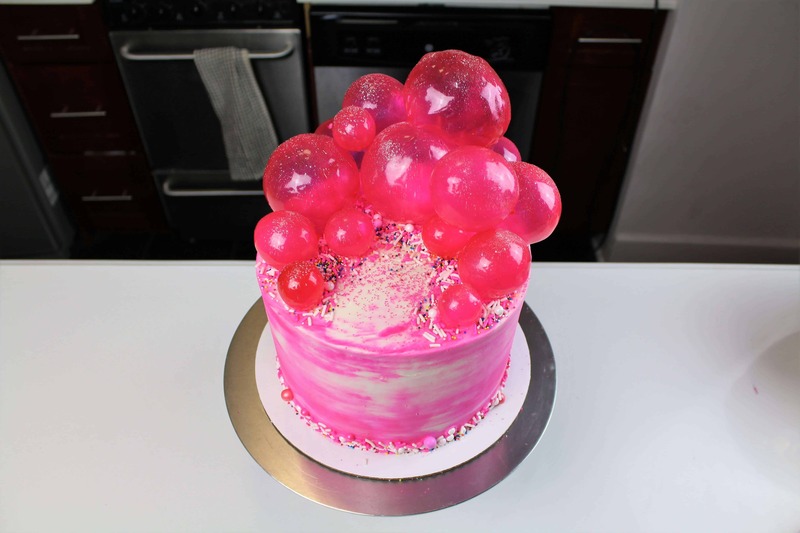 I used my go to vanilla cake batter and american buttercream recipe, and topped it with pink gelatin bubbles. 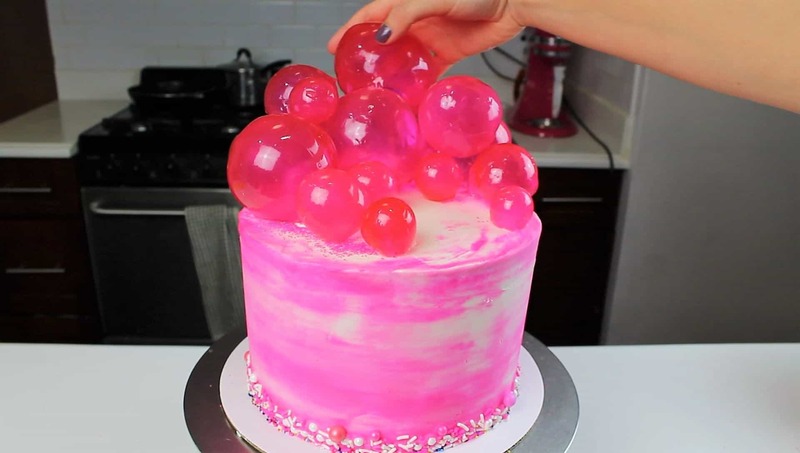 The full recipe and tutorial on how to make gelatin bubbles can be found here. Pour in egg whites, and mix on low until just incorporated. Mix in the buttermilk in two installments, on a low speed. Add in vanilla and oil, and mix at a low speed until fully incorporated. Scrape down the sides of the bowl with a spatula, then beat on medium high for about 30 seconds. Evenly divide that batter between two bowls, and color one bowl light pink, and one bowl hot pink with gel good coloring. Pour batter into each of the prepared cake pans. Bake for 35 minutes, or until a skewer comes out clean. Allow to cool for 10 minutes, then run an offset spatula around perimeter of the pan to separate the cake from the pan. Place cake layers on a rack to finish cooling. To speed up this process you can also pop your cake layers into the freezer until fully cooled. While the cakes cool, prepare the frosting! Beat the butter on high for 30 seconds, until smooth. Slowly add in the powdered sugar, 1 cup at a time. Alternate with small splashes of cream. Once fully mixed, add in the vanilla and salt, and beat on medium low until the ingredients are fully incorporated, and the desired consistency is reached. If the frosting is too thick, add in cream (1 teaspoon at a time). If the frosting is too thin, add in more powdered sugar (quarter of a cup at a time). Color a half a cup of frosting light pink, and another half cup hot pink with gel food coloring. Set aside. To assemble the cake, stack cake layers and smooth an even layer of buttercream on top of each layer. Alternate the bright pink and light pink layers. Apply a thin layer of frosting (crumb coat), and place in freezer to chill for 5 minutes. 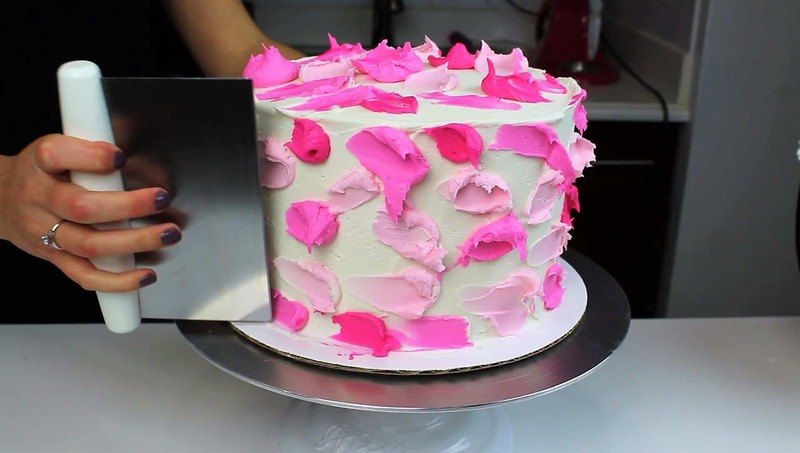 Once fully chilled and firm to the touch, apply a second layer of buttercream, then smear bits of the pink frosting randomly around the cake. Smooth with a bench scraper, making long slow motions. Remove excess frosting from scraper as you smooth. I’ve converted my most popular recipes, but unfortunately I don’t convert all of them :/ so sorry!